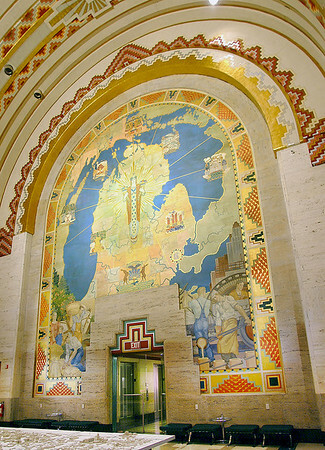 Ezra Winter's three-story mural dominates the south end of the main banking lobby of downtown Detroit's Guardian Building. A Native American princess in the middle holds two horns of plenty. The mural celebrates Michigan's industry, agriculture and prosperity in the 1920s as the auto age catapulted Detroit and the state into the limelight as an important and growing industrial area.